The echoes of Ender's Game drew me in. If our last, best defense against the enemy is a squad of super fast planes piloted by teenagers... I would want those teenagers to be the kids in Breaking Sky. Also, yes, yes I am a little terrified. But then, if our last, best defense was anything done by 30-something mothers of two, I'd be *very* terrified. So perspective, yes? Breaking Sky is two parts teen angst, one part flight and one part cold war. Honestly, this is probably the right mixture because teens under a crazy amount of pressure, living in close quarters with other stressed-out teens *should* have a lot of angst and drama to work through! I really enjoyed this one. I think the end is a little abrupt, but I thought the rest of the story was solid. There were enough emotional highs and lows to keep me engaged without exhausting me. The overarching cold war plot could probably have had a bit more focus, but at the same time, teens. Breaking Sky has a great sense of space - the freedom of the Streakers (super fast jets) alongside the claustrophobia of the Academy, where everyone is aware of everyone else's business was striking. I was very impressed by Chase, who has so many faults, but whom I still really liked. I wanted good things for her, including finding her way through the difficult twists and turns of interpersonal relations. My heart broke for her so many times. 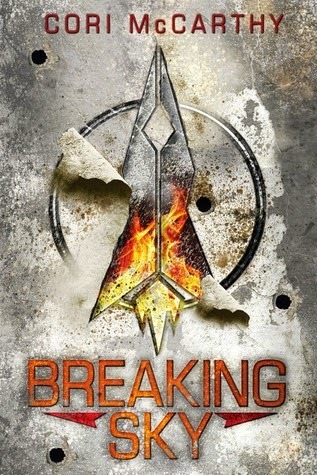 If you like your action stories with a huge helping of drama, or your angsty YA to have a strong sense of purpose, then Breaking Sky is for you!